Am I required to inspect Fixed Ladders in my facility? YES. Though many employers are not aware of the requirement for fixed ladder inspections, OSHA 29CFR1910.27, Fixed Ladders, states in paragraph (f) “All ladders shall be maintained in a safe condition. All ladders shall be inspected regularly, with the intervals between inspections being determined by use and exposure.” The specific intervals for such inspections has been left to the employer to determine. General practice is annually unless conditions such as exposure to weather or chemical contaminants indicate a need for more frequent inspections. 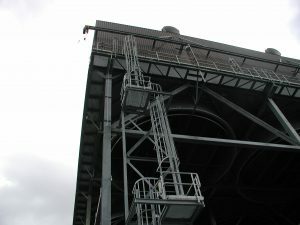 Inspections should include; proper clearances (alterations, additions, or modifications to components near the ladder may have reduced clearances to unacceptable distances; structural integrity, corrosion, condition of bolts and welds, and continuity of electrical grounding protection if present. If a fall protection system is present, it must be inspected in accordance with manufacturer’s recommendations. Records of the periodic inspection as well as any repairs should be maintained on file. Do you have any fixed ladders?